The tree pits are positioned adjacent to the road. They intercept stormwater runoff that would otherwise flow directly into the stormwater drains. This stops pollution and litter from entering our rivers and bays. 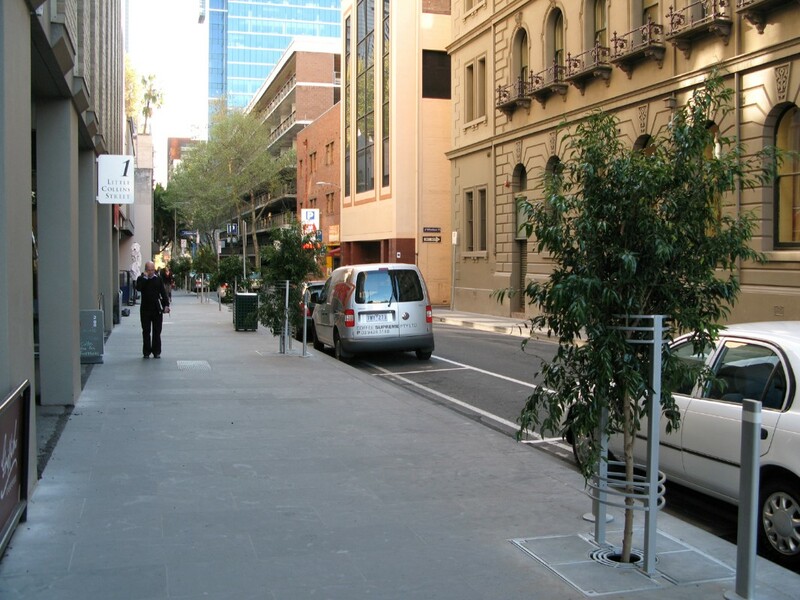 We began installing raingarden tree pits in Melbourne in 2006. 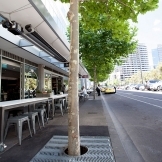 The tree pits are suitable for our central city because they do not take up much space and can be designed for any streetscape. In addition to cleaning the water, tree pits also provide passive irrigation for the tree, reducing the need for manual watering. 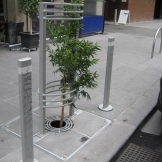 The City of Melbourne has installed over 200 raingarden tree pits across the city and the program is ongoing. What benefits has the raingarden tree pit program provided? Removed pollution and litter from stormwater before it reaches the Yarra River. Allowed better tree growth, which cools the city with shade and evapotranspiration. Reduced the amount of water needed to support a healthy urban forest. How does the raingarden tree pit system work? Raingarden tree pits are designed to collect litter and debris from water before it washes into the drains. 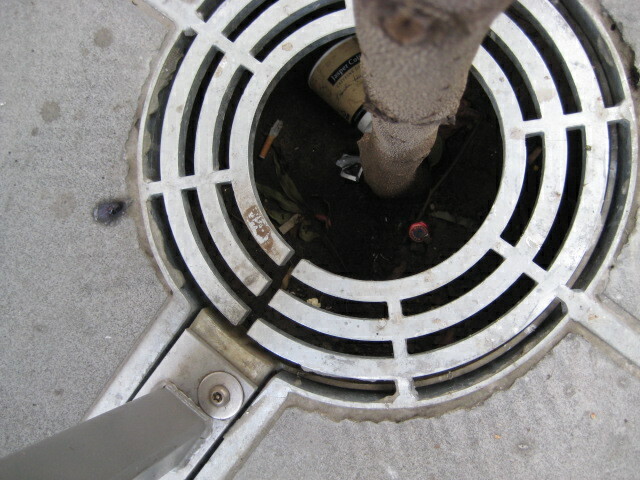 Litter at the base of a tree shows that the system is working properly. We first began installing raingarden tree pits in 2006. The successful program is ongoing. Raingarden tree pits work well in the city because they are smaller than standard raingardens. We install them in footpaths to prevent loss of road or car parking spaces. A single tree is planted in the raingarden, rather than grasses. 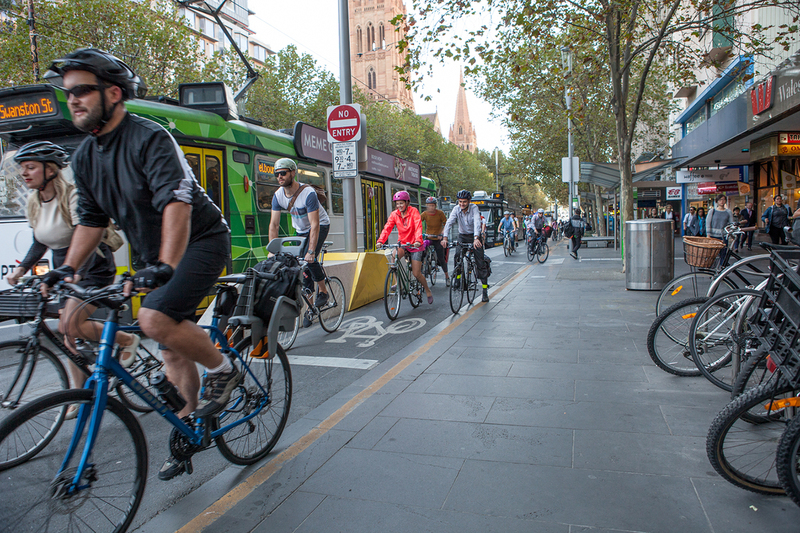 This is consistent with the iconic style of Melbourne’s streets. 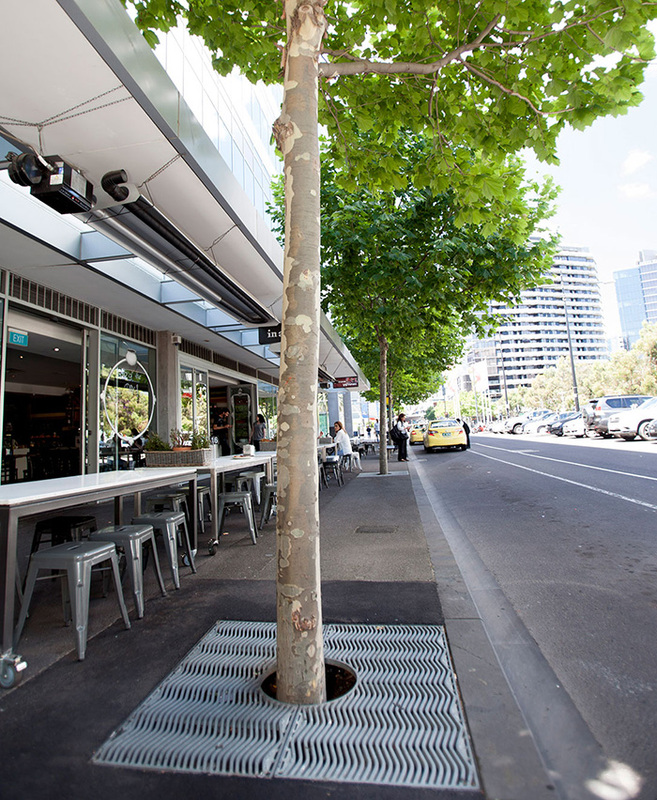 Installing trees also helps us meet our target of increasing canopy cover to aid urban cooling. Typically, raingardens are large garden beds planted with wetland grasses that remove pollution from stormwater. This type of design is not suitable for inner city streets because there is limited space to install raingardens. In busy streets, normal raingardens present a tripping hazard for pedestrians and can be damaged by vehicles. Our challenge was to maintain the stormwater cleaning capability of a raingarden, while modifying the design for inner city streets. A common challenge working in city streets is the presence of underground services, such as fibre-optic, electric and telephone cables, or drainage pipes. Before we implement tree pits, we have to find out whether or not underground services exist in the area. We used the Dial Before You Dig service for information on locating underground utilities. The tree pit designs have evolved since 2006. The first pit lids had a large, 400 mm diameter hole for the tree trunk. This meant that litter collected in the pit. It was also a trip hazard while the tree was young. In later designs, we have included tree growth rings. These reduce the hole around the trunk to 100 mm and allow for the rings to be gradually cut away as the trunk grows. 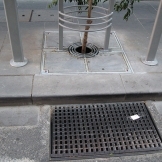 In the municipality of Melbourne we have two preferred standards for tree pit design. 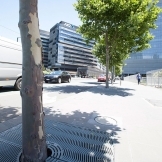 Our design for the Docklands area includes wavy tree pit lids and a kerb inlet. For central city areas we prefer bluestone pit lids with a grated pit inlet. The differences in design cater to the different urban design styles and local conditions in these areas. These pits have the same sub-surface structure as the regular raingarden tree pits but there is no grate around the tree base. They are more suitable in suburban areas with less pedestrian traffic. Uncovered tree pits cost less to install than covered tree pits. 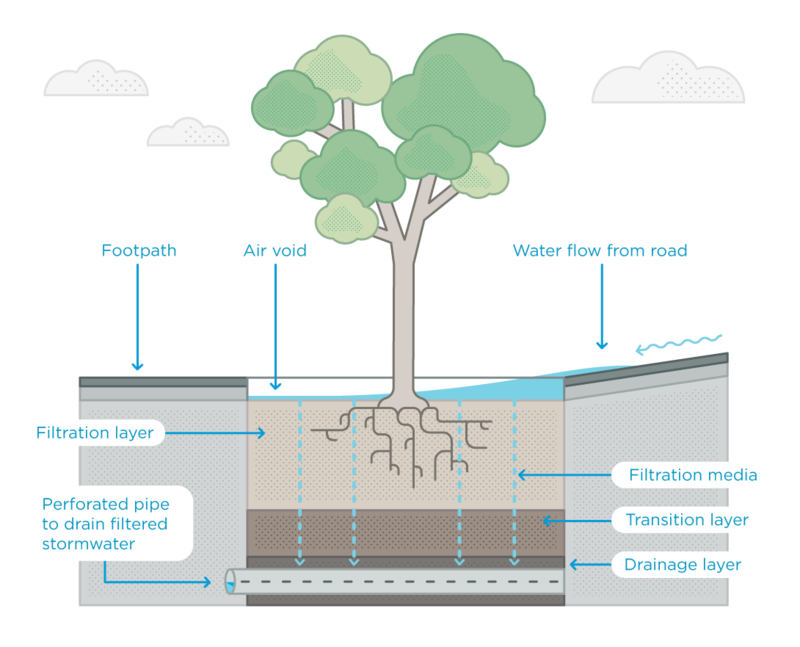 Raingarden tree pits contain three layers of drainage substrate: a filtration layer, a transition layer and a drainage layer. Purpose: This is where all the work happens. This layer filters sediments and larger litter. Phosphorous is absorbed into the filter layer with the sediments. Nitrogen is removed via the plant roots and soil bacteria that exist in the filter media. The filtration layer components should be mixed on site, using a pitchfork. The filter media should only be minimally compacted where necessary, using hand tools. The top of the substrate is positioned a minimum of 50 mm below the invert point in the kerb. This air void allows stormwater to gather on top of the substrate before filtering down through the layers. It provides additional treatment within a confined space. interaction with surrounding infrastructure – buildings, power lines, footpaths. A range of tree species have been planted in raingarden tree pits across the central city, including waterhousia, pin oaks, london planes and turkish hazel. We have carefully chosen tree species that work towards our species diversity and resilience targets. These targets are set out in our Urban Forest Strategy. 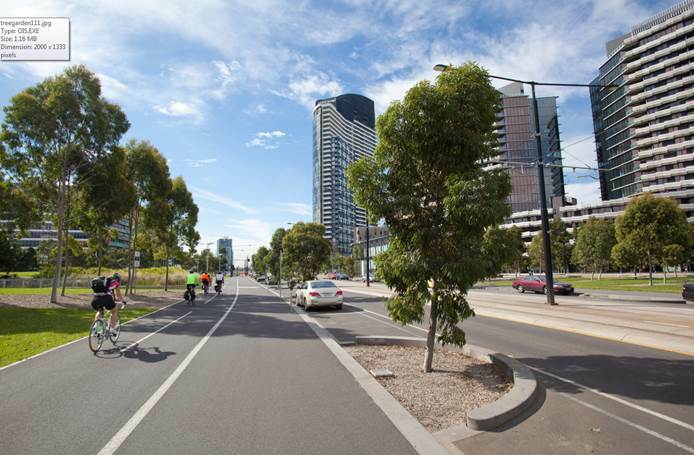 All tree planting in the City of Melbourne is guided by our Urban Forest Strategy. 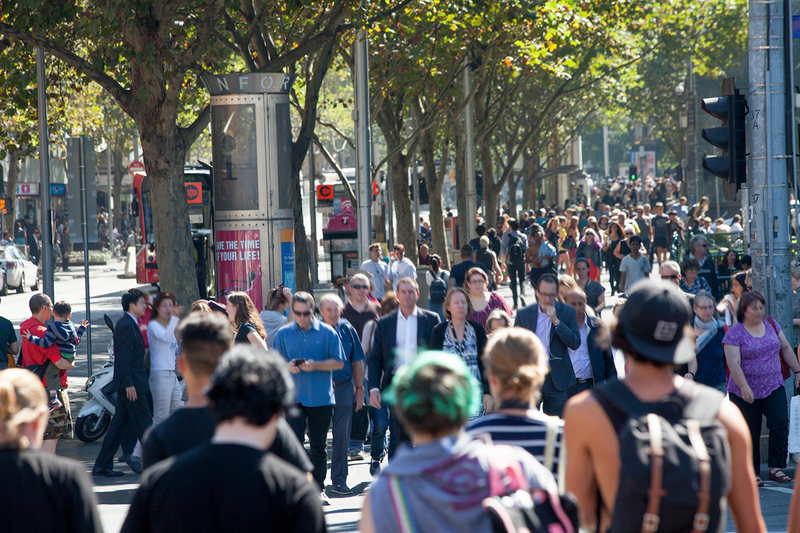 This strategy aims to double canopy cover in order to cool the city by 4 degrees by 2040. It also sets out targets for tree species diversity. A drainage pipe with slots in it sits in the drainage layer at the bottom of the tree pit. It is connected to the stormwater drain. The pipe allows filtered stormwater to flow to waterways and prevents water logging at the trees roots. The high flow bypass makes sure that heavy rain flows are safely conveyed to the conventional drainage network. The bypass is provided by side entry pits located downstream of the raingarden tree pit inlets. Excessive sediment load will cause the filter media to clog. Best practice site management during construction is required to minimise the sediment load. During the construction phase, the raingarden tree pit can be protected with a geotextile layer. This is placed on top of the filter media and then covered by turf. Once construction is completed the turf can be removed, along with any sediment build up. The tree can then be planted. Each raingarden tree pit costs between $4000 and $8000. The price varies depending on the type of design, which is influenced by how busy the street is and the existing infrastructure. 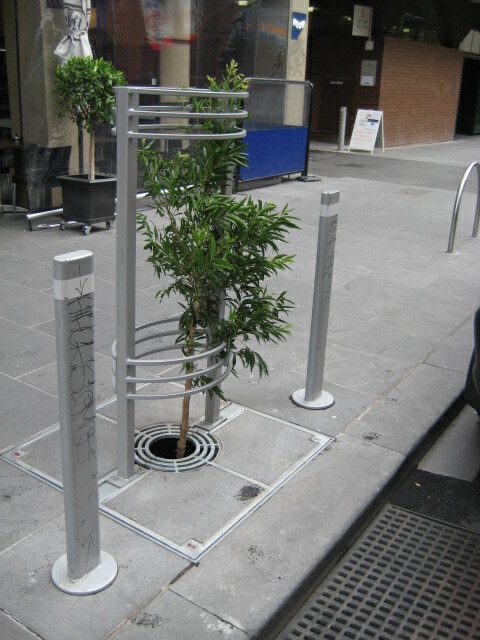 Much of the cost is associated with the tree pit lids, bollards and tree guards. Comparatively, a planting a normal tree in a street usually costs less than $1000. However, in the long run raingarden tree pits provide better value for money because they require significantly less mains water for irrigation. We have found that in the first two years after planting, a tree in a raingarden pit uses 70% less water than a standard street tree. Raingarden tree pits are designed to need minimal maintenance. However to ensure stormwater can flow from the gutter to the tree pit, street sweepers do need access to clean litter from the inlet. 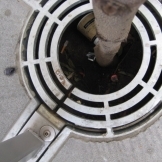 Covering the tree pits with a grate around the base of the tree helps to prevent litter accumulating on the surface of substrate. Periodic cleaning is required on all tree pits. 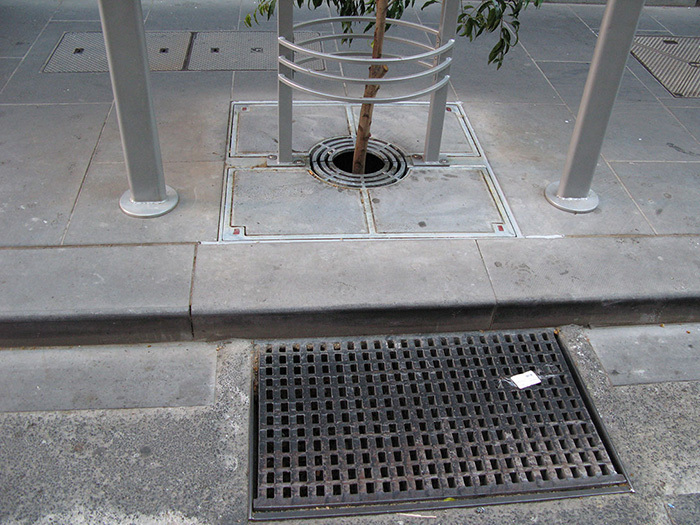 The amount of cleaning needed depends on the design of the cover and the location of the tree pit. We clean the pits by hand or use a suction hose to remove any litter and sediment build-up from the top layer of the substrate. The typical annual maintenance cost of a raingarden tree pit is five to seven per cent of the total construction cost. 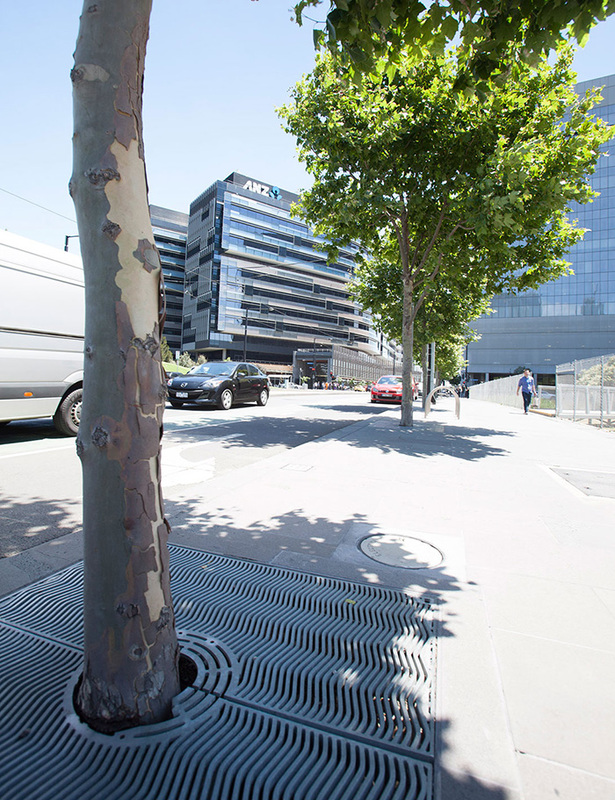 This equates to between $200 and $560 for each tree pit in the City of Melbourne.